This heavenly equilateral triangle is a landmark of the winter night sky and is formed by our brightest night sky star, Sirius, the giant star, Betelgeuse, and the brightest star in Canis Minor, Procyon. Graphic: Distant Suns by Virtual Reality Laboratories, Inc.
a path that the planets follow. This graphic shows the dazzling night sky view of February 9, 2002 at 9:00 p.m., when Jupiter and Saturn added striking special effects to an already stellar performance! Orion the Hunter with Betelgeuse at his shoulder leads the triad west toward the horizon, the Dog Star, Sirius, shines in the south and Procyon, the smaller dog follows in the east. 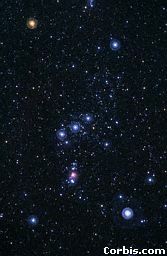 Look Up high in the heavens to locate the three stars making up the belt of Orion. If you focus on the three stars in the Belt of Orion and follow them southeast, you will find they point to the brightest star in the heavens, Sirius (not shown in the above graphic; see Winter Stars). If you draw your focus out from the middle star of Orions Belt you will find that it points to the reddish star Betelgeuse in one direction and to a bluish star, Rigel, in the other direction. If you are looking at a bluish star, go back to the middle star of Orions belt and draw your focus out in the opposite direction until you see the reddish star. Locating Sirius and Betelgeuse gives you two of the three points of the Winter Triangle. The third point, Procyon, is located well to the upper left of Sirius. "One reason Sirius and Procyon look so bright is that they are among the closest of all the stars. Sirius lies 8.6 light-years, and Procyon 11.4 light-years, away from Earth. If you show them to kids whose ages are about 9 and 11 you can describe them as their birthday starsthe light they see tonight left Sirius and Procyon around the time these children were being born." "So, is Betelgeuse also someone's birthday star? I hardly think so unless, of course, you were born 525 years ago because when we look at Betelgeuse this winter we are actually seeing the light that left it in the year 1475, 17 years before Columbus 'discovered' the new world. So get thee outside and witness the wonder of the Winter Triangle." This is the first direct image of a star other than the Sun. Called Alpha Orionis, or Betelgeuse, the star is a red super giant, a Sun-like star nearing the end of its life. The Hubble picture reveals a huge ultraviolet atmosphere with a mysterious hot spot on the stellar behemoth's surface. The enormous bright spot, more than 10 times the diameter of Earth, is at least 2,000 degrees Kelvin hotter than the star's surface. Note that the size of Betelgeuse is greater than the size of Jupiter's orbit. 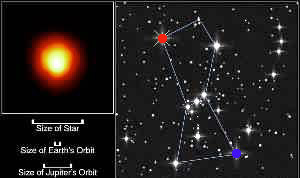 Rigel is the blue star opposite red Betelgeuse in the constellation Orion. The Ageless Wisdom teaches us that the forces emanating from Betelgeuse and Sirius can aid in the service of those who are spiritually attuned. If you are one of these people, just open your heart to Betelgeuse and your crown chakra (head center) to Sirius. Allow the evolutionary energies to flow in and take hold. May only the Greatest Good come forth!